A new pope, crazy Kim, and Facebook math wars: The week’s most interesting Slate stories. Pope Francis, Argentina’s Jorge Mario Bergoglio, leads a mass at the Sistine Chapel at the Vatican on March 14, a day after his election. “Why Pope Francis May Be a Catholic Nightmare: He may seem like a humble reformer, but Cardinal Bergoglio is the last thing the Vatican needs,” by Michael Brendan Dougherty. 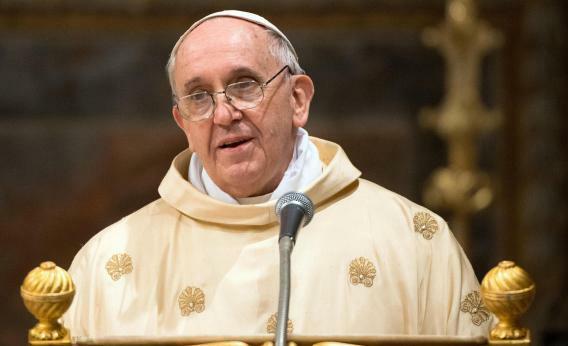 Wednesday’s election of Jorge Mario Bergoglio as Pope Francis marked the ascension of the first-ever pontiff from the Americas. Dougherty is wary of the choice, citing the new pope’s age, theological vagueness, and unfamiliarity with the Vatican’s curial offices as reasons why Francis may be a transitional and mediocre Pope. “Who’s Afraid of Kim Jong-un? : Maybe we should be. What we don’t know about North Korea’s young leader may be the scariest thing of all,” by Fred Kaplan. North Korea is amplifying its threats against South Korea, and while these kinds of escalations are nothing new, there is a real possibility that Kim Jong-un is making strategic miscalculations and overplaying his hand in a ways that his father and grandfather never did. “Smart, Poor Kids Are Applying to the Wrong Colleges: How an information mismatch is costing America’s best colleges 20,000 low-income students every year,” by Matthew Yglesias. Yglesias sheds light on a new study showing that high-achieving students from low-income families are less likely than those from high-income families to apply to selective colleges. He argues that, by improving outreach to students in often-ignored rural areas, selective colleges can broaden their applicant pool. “No Nuts, No Glory: The perks of having a life-threatening food allergy,” by Elizabeth Weingarten. New treatments that immunize against allergens are helping people overcome food allergies, but at what cost? Weingarten celebrates the positive effects her dangerous tree nut allergy has had on her character. It taught her to be assertive, persistent, and calm in high-stress situations. “What Is the Answer to That Stupid Math Problem on Facebook? : And why are people so riled up about it?” by Tara Haelle. Seemingly simple arithmetic problems are going viral on Facebook—and made a lot of people very upset. Haelle explains that there are different conventions at work and concludes by saying that by expecting “one right answer,” people might be asking too much. “You Say ‘Best.’ I Say No: It’s time to kill the email signoff,” by Matthew J.X. Malady. If you’re thinking of ending an email with “Cheers,” “Regards,” or “XOXO,” think again, writes Malady. While valedictions were logical and necessary in the age of handwritten letters, the sheer volume of modern emails makes formal signoffs unjustifiable. “Regrettable: The troubling things I learned when I re-reported Bob Woodward’s book on John Belushi,” Tanner Colby. Colby, who co-authored a 2005 biography of comedian John Belushi, offers an extensive critique of journalist Bob Woodward’s 1984 book on the same subject. He claims that the many subtle inaccuracies and misinterpretations in Woodward’s work may shed light on the recent controversy over alleged threats made by the White House against the journalist. “Why Did Google Reader Die? : And what free Web service will be next?” by Farhad Manjoo. This week Google announced that it will shut down its decreasingly popular RSS reader—and Manjoo isn’t shedding a tear. Nor is he optimistic about the fate of some other free Google products with fishy business models, explaining that the best way to ensure the survival of your favorite Web app may be actually paying for it. “Who’s No. 1? Who Cares. : The totally pointless debate over where to seed the top teams in the NCAA Tournament,” by Ken Pomeroy. In the run-up to this year’s March Madness tournament, college basketball fans are eagerly anticipating the bracketing and seeding announcements for the 68 teams. Nevertheless, Pomeroy asserts, seeding decisions have a much smaller effect on who will actually win the tournament than regional placement.